This book provides you with “The Data” using exerts of resources on the challenges of high abilities. It gives a personal story in “The Experience” of the challenges. Then leads the way for your own introspection and growth through “The Quest”. This is a tool for acknowledging and expressing your multi-talents. Darlene Johnston says: I had a hard time putting it down. Did you realize that this is so much like your Dad? I wish I had this knowledge when you wee growing up and I would have understood your Dad and You. This is one of the greatest story I have read. I thank you for writing it down and I know if anyone has a gifted child or around someone who they don’t understand this book would really help. Douglas Eby says: “Being multi-talented includes a complex wealth of personal qualities and exceptional abilities, as well as multiple challenges both from within and from interactions with others. Dr. Johnston includes in her book a variety of helpful material to help us better understand these complexities, using quotes from well-known writers on giftedness plus her personal experiences and perspectives as a counselor. Douglas Eby – writer, researcher and online publisher on the psychology of creative expression and personal change. He is author of the book “Developing Multiple Talents: The personal side of creative expression” and creator of the Talent Development Resources series of sites http://talentdevelop.com. Welcome to a side track in the life journey of a multi-talented individual! 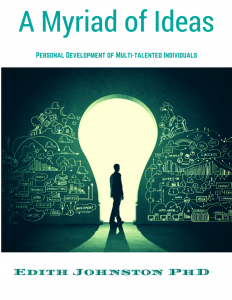 This is a workbook for you to follow a Quest in understanding, overcoming, developing, expressing, and connecting with your Multi-talents. A tool for stepping out into life.